The “Blog” of “Unnecessary” Quotation Marks: creepy! Human burgers: now with fewer transfats. Thanks, Sarah. Surely whoever made that sign had a Soylent Green joke in mind. Right? WV: tzsque--a Greek yogurt-and-cucumber dip. Well i must say, they're not very good at keeping secrets. Aaand, is 'soylent green' more tasty then tvp burgers? 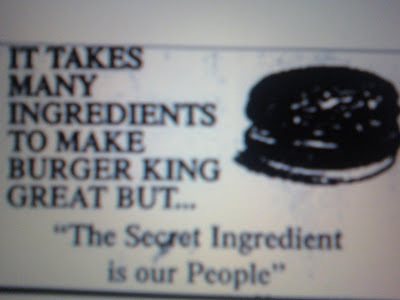 One more thing, if their 'secret' ingredient is their people, does that explain why they seem so short staffed? I think someone should have a word with the Union too. I mean... thousands of people must be dieing to become hamburgers! Or do they just use people that have recently died? Domino's has a campaign with "Our Most Important Ingredient is Our People" written on the recruitment brochures. In fact, if you google that phrase, you can see for yourself.